The geomagnetic field was quiet to very severe storm on June 22. Solar wind speed at SOHO ranged between 335 and 712 km/s. 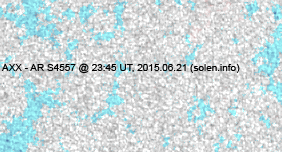 A sudden increase in solar wind speed was observed at 04:52 UT at SOHO, the arrival of the June 19 CME. 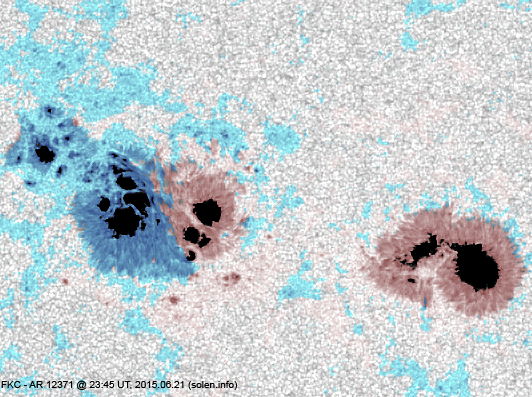 A strong solar wind shock was recorded at 18:01 UT at SOHO, this was the arrival of the CME observed early on June 21. The interplanetary magnetic field was very strongly southwards just after the shock and this caused very severe geomagnetic storming. 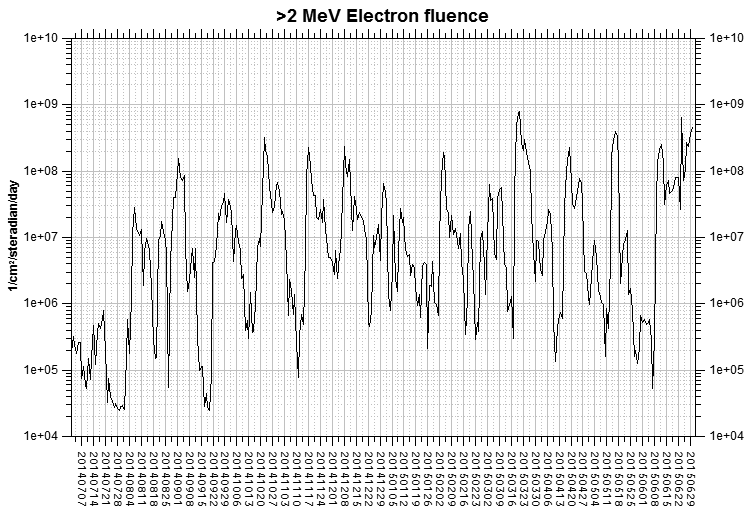 Solar flux at 17h UTC on 2.8 GHz was 130.1 (increasing 35.6 over the last solar rotation, the measurement at 20h was flare enhanced). The 90 day 10.7 flux at 1 AU was 128.7. 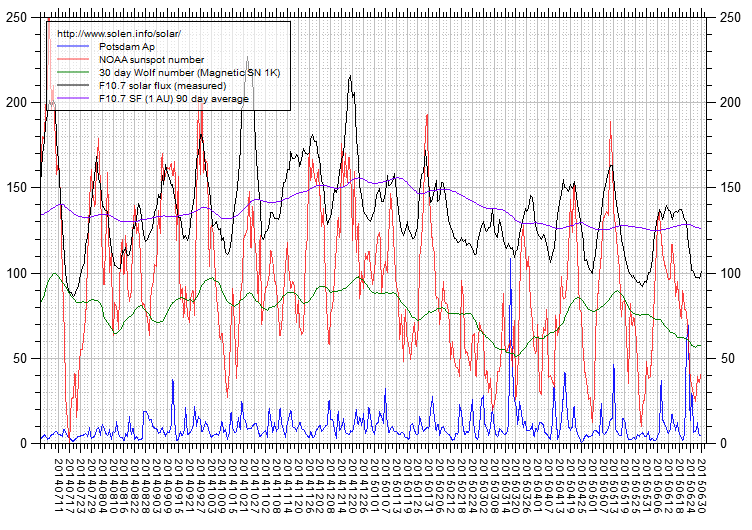 The Potsdam WDC planetary A index was 55 (STAR Ap - based on the mean of three hour interval ap indices: 55.4). 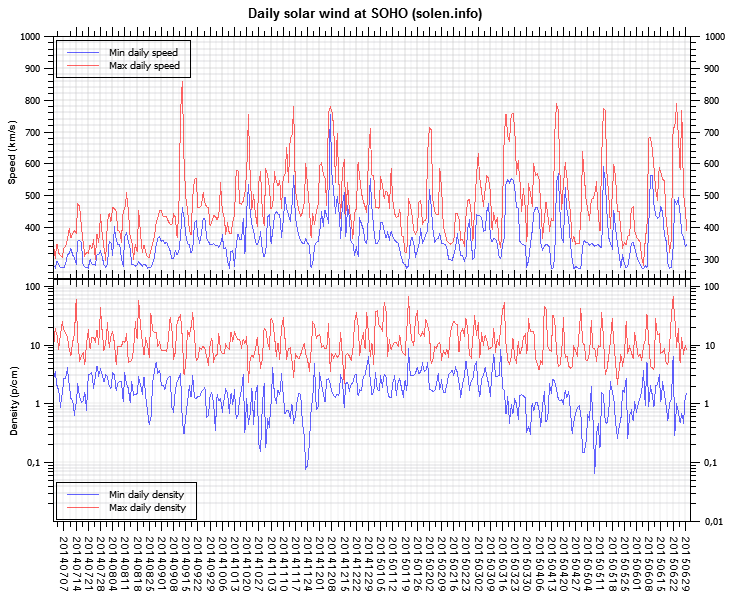 Three hour interval K indices: 23435585 (planetary), 24435585 (Boulder). 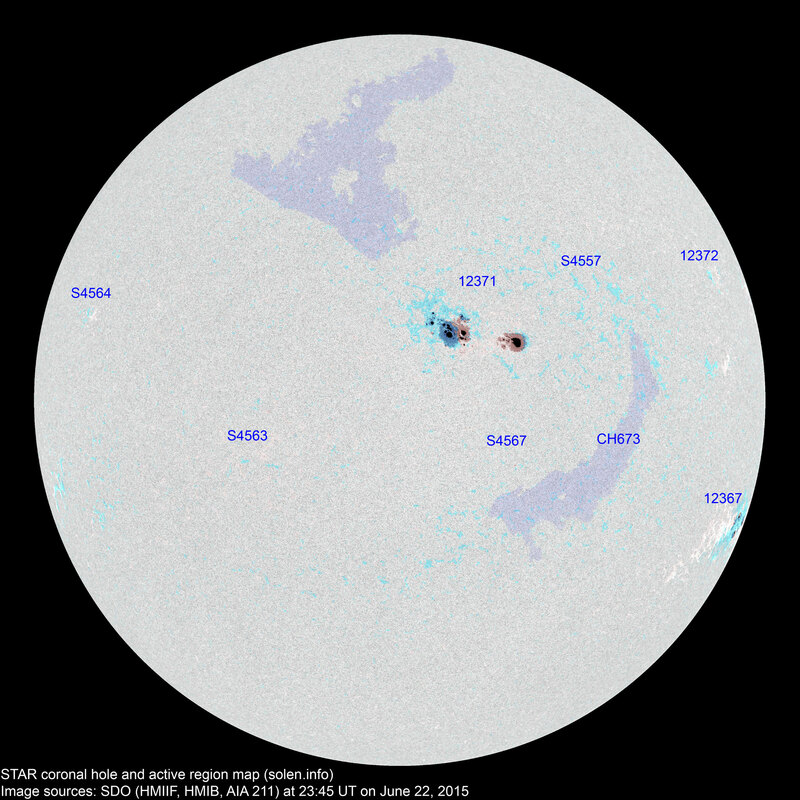 At the time of counting spots (see image time), spots were observed in 7 active regions using 2K resolution (SN: 144) and 4 active regions using 1K resolution (SN: 84) SDO images on the visible solar disk. 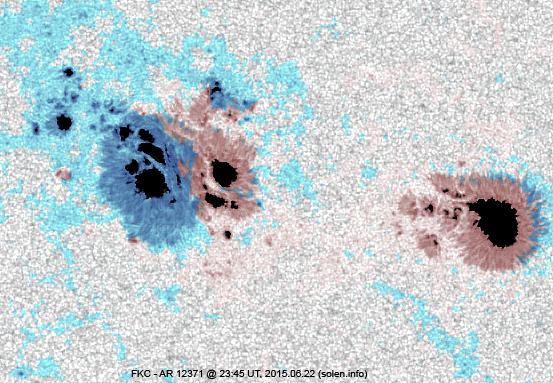 Region 12367 [S19W79] rotated to the southwest limb and produced a few C flares. A minor M class flare is possible while this region is near the limb. Region 12371 [N11W12] lost some penumbral area in the leading spot section. There is still a large magnetic delta in the trailing penumbra and further major flares possible. New region 12372 [N20W67] emerged with penumbra spots. S4557 [N20W29] was quiet and stable. S4563 [S09E24] was quiet and stable. S4564 [N14E61] decayed and could soon become spotless. New region S4567 [S09W18] was observed with a penumbra spot. 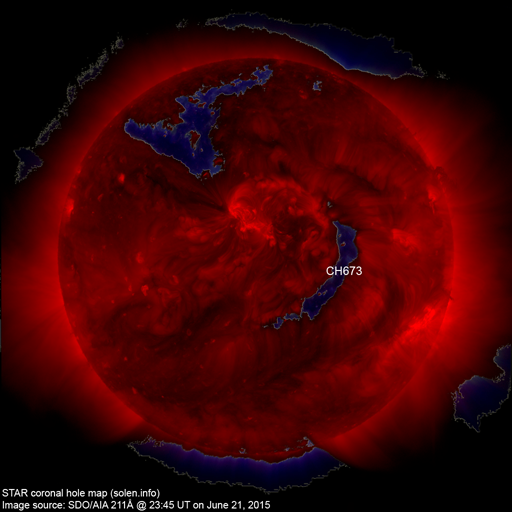 A recurrent northern hemispere coronal hole (CH673) was in an Earth facing position on June 19-20. 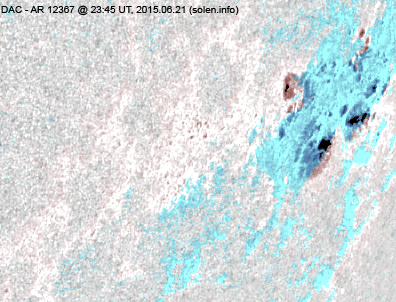 CH673 did not cause a significant geomagnetic disturbance during the previous rotation. 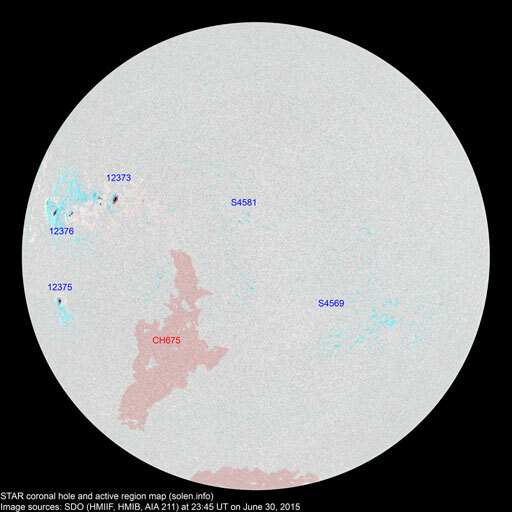 CH673 decreased in size June 16-18, but became larger following a filament eruption in the southern hemisphere on June 19. The geomagnetic field is expected to be unsettled to severe storm on June 23 due to effects from the CME which arrived on June 22. Another CME arrival on June 24 could cause unsettled to major storm conditions that day and on June 25.